Aberu Kebede Shewaye- Africa’s Shining Star. The Federal Democratic Republic of Ethiopia stands out in the great continent of Africa for several unique reasons. Its beautiful capital city of Addis Ababa is a joy to behold. Ethiopia is a society with more than 80 ethnic groups, the second most populous country in Africa after Nigeria and the origin of the coffee bean. Beyond these, I am drawn to the richness of this great country. Richness not summed in any currency, but in the people. Aberu Kebede Shewaye is one of such great Ethiopians whose contribution has uplifted the face of Ethiopia and repositioned Africa. Born 12 September 1989, Aberu Kebede Shewaye spent most of her growing years in Shewa, Ethiopia. It was in Shewa that she took her first baby steps towards her purpose. She made her first appearance in Cross country running. Having come third in the junior race at the 2007 Jan Media Cross Country International, she was qualified to take part in the 2007 IAAF World Cross Country Championships, where she finished 16th in the junior women’s race. 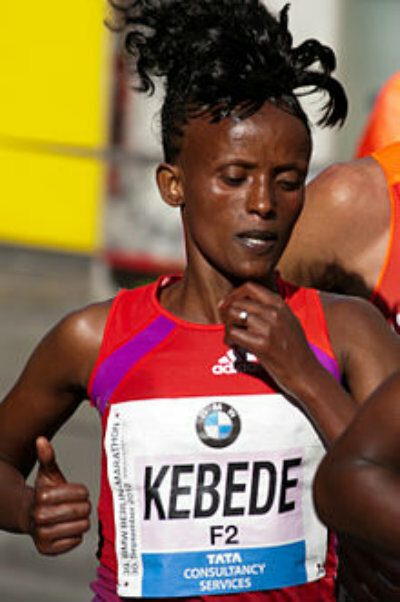 At the 2008 Women First 5k race in Addis Ababa she upped her game, finishing fourth place. 2009 launched her into an amazing victory. In April, Aberu won the Stramilano Half Marathon, setting a course record and personal best of 1:08:43. Next on her timeline was the Ethiopian championships. And like her fans expected, she pulled if off sweetly at the Ethiopian Athletics Championships in May, where she scored a national title in the 10,000 meters beating her foes Mamitu Daska and Wernesh Kidane to the domestic honours. Later that month, she ran at the World 10,000 Bangalore and was handed her fair share of disappointment when she missed the winning spot by a few seconds, eventually finishing in third. The track star never lost heart; instead she worked harder and improved her game. She made a beautiful appearance in June and had a 10,000 m best in Utrecht, setting a time of 30:48.26, which qualified her to be selected for the 2009 World Championships in Athletics. Although, she ultimately did not compete. Aberu ran at the Women’s 5k Challenge held in London and finished third. Running at her first senior championships, she ended up with a bronze after losing out on a sprint finish against Philes Ongori. 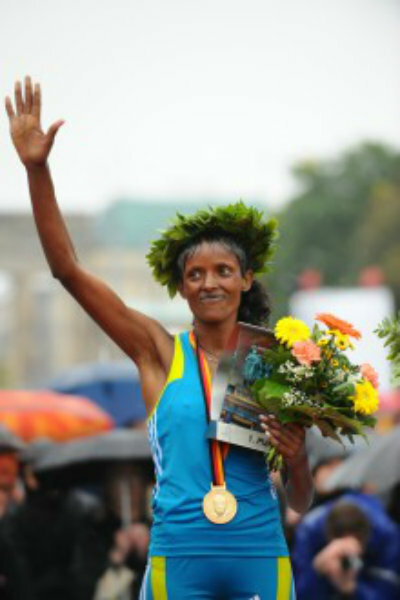 But then, she managed to improve her best to a time of 1:07:39 and lead the Ethiopian women to the team silver medal. This achievement made her the second fastest Ethiopian woman over the distance after Dire Tune. Again In November the same year, she finished in 1:07:59 for third at the Delhi Half Marathon behind Keitany who broke the course record. 2010 marked the beginning of thirds for the track queen, as she began the year with a debut over the marathon distance. At the Dubai Marathon, she lost to Mamitu Daska, but ended second place on her debut, recording a time of 2:24:26. She started off with great vigor in 2010 at the Rotterdam Marathon, always at the lead and won in a time of 2:25:25. At the Berlin Marathon, she maintained a front-running performance, beating fellow Ethiopian Bezunesh Bekele to win the race. She set a new best time of 2:23:58 and ran the second half of the race faster than her first, crossing the line just a minute ahead of the opposition. The 2012 Dubai Marathon was one of her biggest wins, she ran a personal best of 2:20:33 to move into the top twenty fastest women ever, although the high quality of the race meant she finished in fifth place overall. A sixth place finish at the 2012 London Marathon followed and she narrowly missed out on a spot on the Olympic team with her run of 31:09.28 for fifth at the 10,000 m trial at the Prefontaine Classic. The leading lady ended her year with wins at the Great Ethiopian Run and the Ethiopian Clubs Cross Country Championships. She won the 2013 Tokyo Marathon, her first race of the year, and was six seconds off the course record in a terrible weather condition. Keep at it girl, Africa celebrates you.